Originally broadcast on July 12, 2006. "Now, more than ever, two myths must be laid to rest. One, sharks are not mindless predators nor sinister man-eaters, and two, the oceans are not full of sharks." For thousands of years, sharks have haunted the human imagination. These perfect predators, 400 million years in the making, are unique hunters with awesome power. But their reputation as cruel, senseless killers of human nightmares is a far cry from reality. These powerful creatures play a vital role in the intricate balance that makes up the oceans' ecosystem . Today, a new predator , the human, puts these amazing creatures at risk, giving sharks far more reason to fear us than we have to fear them. The relationship between sharks and their prey is ancient and complicated, each depending on the other to maintain balance within the ecosystem. Brutal modern fishing practices, such as long-lining , and new demand for shark fins have decimated shark populations around the globe. Every year, 100 million sharks are killed by people. (An estimated 50 percent of those deaths are accidental, sharks getting caught up in nets that are set to catch other kinds of fish.) In fact, the populations of great white and hammerhead sharks have plummeted by 75 percent over the last 25 years. But this slaughter has not drawn much public sympathy because many people view sharks as a menace. Yet the truth is that sharks are a vital link in the food chain . When shark populations decline sharply, the results can be dramatic, upsetting the balance of the oceans and producing unintended consequences with effects that can reach around the globe. In Sharks at Risk, Jean-Michel Cousteau and his team meet sharks face-to-face in two intense expeditions. The first takes place in French Polynesia in the Tuamotu Archipelago at Rangiroa , the second-largest coral atoll in the world and an underwater paradise that is famous for its large concentration of sharks. The second is off the coast of South Africa , at the Cape of Good Hope , where Jean-Michel and others swim with the most feared of all sharks -- the great white. There are two harmful myths the divers hope to dispel: that sharks are bloodthirsty man-eaters and that sharks are everywhere. The plain fact is that of the nearly 400 species of sharks, few are known to attack people. The rare attacks are usually cases of mistaken identity -- a shark mistakes a swimmer for a tasty seal or other preferred prey . And far from what Hollywood would have us believe, the seas are not full of sharks. Experienced divers can dive for years and never see a single one of these incredible creatures. 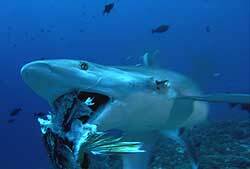 At Rangiroa, the team dives into the sharks' feeding grounds: the nutrient-rich waters surrounding the atoll. Even for the experienced Cousteau team, diving with large numbers of sharks is a new and exciting experience and one that must be taken very seriously. The divers see such exotic creatures as silvertips , spotted eagle rays and a school of gray reef sharks . The sharks cruise around the divers, keeping their distance, but coming close enough for the crew to see their battle-scarred skin. One shark's dorsal fin is missing a huge chunk, evidence of a run-in with trouble, human or otherwise. During a night dive, the team explores active underwater cities aglow with brilliant colors and bursting with action. Crowds of surgeonfish mate at the full moon and release their eggs to the currents. Photosynthetic plankton , the foundation of the oceanic food chain, swirl everywhere, visible in the divers' lights. As the oceans' producers , these plankton convert sunlight into usable energy for almost all ocean life. Rangiroa is the largest atoll in French Polynesia. 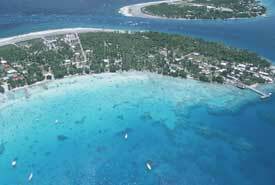 The village of Rangiroa, which rises only 10 feet above sea level, is home to approximately 3,000 residents. The livelihood of the entire community depends upon the continued abundance of the sea, and they understand that the key to the future is conservation and balance. The fishermen of Rangiroa now have to respect new limits on fishing, and breaking these rules is punishable by jail. The Cousteau team visits a local family fishery that uses simple traps to catch the fish as they swim in with the tides. Despite local efforts, the fish are disappearing from the lagoon and the open sea. Foreign long-liners are multiplying "like seaweed," says one local fisherman. The changes brought by overfishing are clear. Tuna are gone. Squid are multiplying rapidly because their predators are dwindling. The balance of the sea is already upset, and Cousteau fears that people dependent on the oceans for their livelihoods may turn to hunting sharks. The market for sharks -- sharks fins to be exact -- is growing. In Asia, where serving shark fin soup is a sign of prosperity, a single pound of shark fins can sell for $328. As a result, the shark is a profitable target. Finning is a brutal practice. The sharks are stripped of their fins while the rest of their bodies are thrown back into the sea as waste. It is an unprecedented slaughter, and the ultimate effects may well be catastrophic -- not just for sharks, but for the entire sea. Off Rangiroa during the mating season of the gray reef shark, the Cousteau team encounters competitive and territorial male sharks schooled together by the hundreds. The fish are uninterested in the divers, focusing instead on their biological task at hand. In the aggressive mating ritual of gray sharks, the males bite the females in order to subdue them. Females have developed thicker skin over time as protection from this brutal mating ritual. The team watches a violent scene as one male has a disturbing interaction with a female, which ends in death -- the blood from the female's wounds confuses the male shark, and his efforts to mate become efforts to kill. 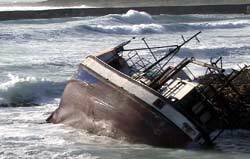 A treacherous maze of jagged rocks and tiny islands, the Cape of Good Hope has claimed some 2,700 shipwrecks in its cold, turbulent waters. The Cousteau team leaves Rangiroa and heads to the rugged coast of South Africa, searching for a different encounter. Here they will greet the famous, ferocious shark of legend -- the great white. Reaching up to 20 feet long and weighing up to 4,000 pounds, great whites are able to swim in bursts up to 25 miles per hour. They live primarily in the waters off the coasts of the northeastern United States, Northern California, Australia and South Africa, which is home to one of the largest concentrations. Here, in a channel between Dyer Island and Geyser Rock, is "Shark Alley," so named for the large concentration of sharks that feed off the nearby Cape fur seal rookery . Jean-Michel's guide here is Andre Hartmann, a commercial fisherman turned shark tour guide. Jean-Michel and Andre take two carefully planned dives to get up close and personal with these massive predators of the deep. First, a 15-foot-long great white approaches, curious, and taps a hard piece of camera equipment with its nose. The 1.5-ton animal remains unthreatened and takes its time before swimming away. The second dive is more intense. Jean-Michel and Andre snorkel near the surface, a very vulnerable position because great whites tend to feed from the sea floor up. An enormous great white advances, and the divers are careful not to provoke it. There is a waiting game. 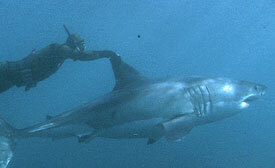 Eventually, the shark allows the divers to touch it. Then, amazingly, unlike its terrifying man-eating reputation, the great white allows the divers, one at a time, to grip its dorsal fin and be taken for a ride through the clear blue waters. Great white sharks can reach up to 20 feet long and swim in bursts up to 25 miles per hour. This great white showed itself to be a more complex creature than its cruel man-killing image. Similarly, the shark as an entire species is more complicated than most people know. Sharks are difficult to study, and every day, scientists are gaining knowledge about these predators that is changing our understanding of them. At the same time, new and increasing dangers are threatening their very existence. With Sharks at Risk, the Cousteau team hopes that more people will understand the complexity of these majestic creatures and the vital role they play in the fragile ecosystems of our oceans and our planet.